Station wagons, as pointed out by ex-Autoblogger Jonny Lieberman, are boring. "It's the penalty you pay for falling in love and having children," he says. Sure, just so long as your children like to go fast, at least when the chosen conveyance to move those booster seats from Point A to Point B is either the wagon version of the Cadillac CTS-V or Mercedes-Benz E63 AMG, as tested by Motor Trend in the video you'll see after the break. Without spoiling any of the salient details, we'll say that one car was a wee bit quicker, crossing the finish line a scant 79 feet ahead of its rival after a half-mile of acceleration to speeds surpassing 150 miles per hour, while the other was deemed the overall better car for enthusiast drivers. 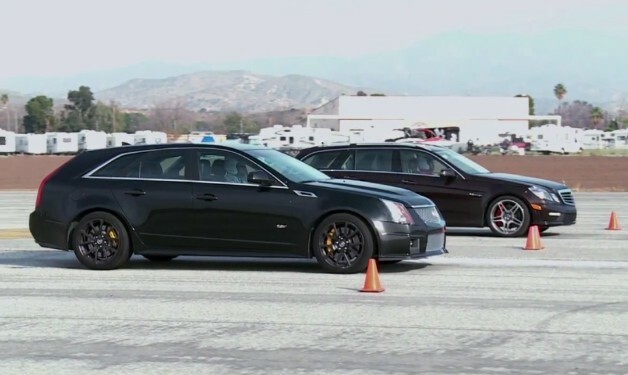 Motor Trend pits Cadillac CTS-V vs Mercedes-Benz E63 AMG in wagon-off originally appeared on Autoblog on Wed, 21 Mar 2012 19:59:00 EST. Please see our terms for use of feeds. Two very impressive cars to say the least. I'm happy to see Americans building world-class cars again.